Chrome OS users are reporting an alarming bug in the latest stable version of the operating system. Something in the most recent update is causing the CPU usage to sky rocket to 50-100 percent capacity on certain systems. Amusingly, developers believe it may be related to checking the CPU usage in the task manager itself. This issue appears to only be affecting users on the Stable v72 or the newer beta and dev updates of Chrome OS. 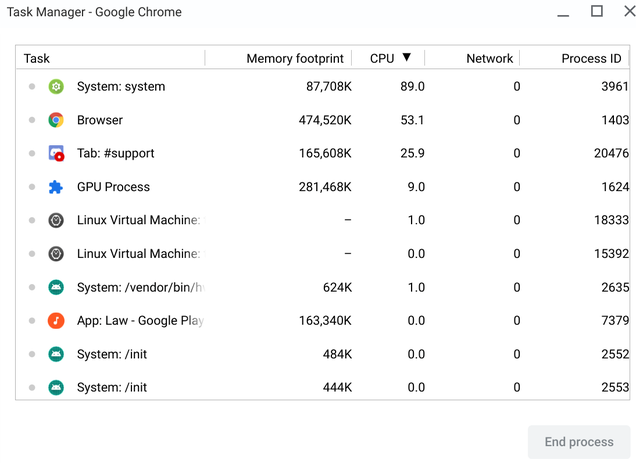 According to a smattering of complaints on the official Chromium blog as well as numerous posts on Reddit, people have found that Chrome OS on some devices such as the Pixelbook and Pixel Slate seems to be using all of its CPU, resulting in reported hits to performance, overheating, and reduced battery life.